Faith… it seems to be revolving around everything Christina does and it is a hard lesson to learn. She must have faith she can save her brother. She must have faith that her friends scattered all over Meric will survive. She has to have faith that all of Shaw’s secrets are coming to an end. She even has to have faith in herself and her Guardian powers. The evil tyrant, Leticia, has sent out her dark priest, Neamiah, to convince the people of Meric Leticia is god. The people will have to take her mark or die. Christina’s greatest test of faith lies ahead… She must prove to the people of Meric that Leticia’s claim to lordship is false and that the Creator is the only true God. 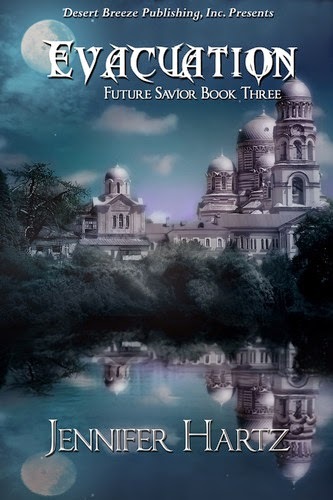 The extraordinary tale of Christina, Shaw, and the fantastical land of Meric continues with book three of The Future Savior series, Evacuation. Now confidant in her newfound supernatural abilities, Christina knows it’s only a matter of time before she must step up and lead the people of Meric. What she doesn’t count on is the inner struggles she must deal with as well as the physical, like having faith that the Creator will guide her way and trusting the people around her. Queen Leticia is claiming to be a deity and forcing people to take her mark or be killed. Christina knows she must stop the queen before it’s too late and save her brother from Leticia’s evil clutches. Is the time finally approaching when she will have to battle Leticia and her army? Will her ever growing faith in the Creator carry her through with her life intact? Wow, these books just keep getting better and better, if that’s even possible. I really can’t believe I hadn’t discovered them until recently. Why isn’t this series more well known?! Evacuation, like Conception and Resurrection, is woven in a way that completely and immediately draws you in. Again, being as this is book three in the series I really don’t want to give away spoilers so I won’t go into too much detail, but I will tell you that in Evacuation things get even crazier. There were some pretty HUGE reveals! Making it even more exciting and endearing, this book also provided a deeper understanding into what makes the characters the people that they are. Another thing that made me really happy was the fact that faith became a more predominant part of the story than in the previous two books. It’s coming to the point in the story where you know the characters pretty well and you’re now becoming more and more curious about the true origins of Meric. The cliffhanger at the end of this book promises even more big and crazy revealings to come. And I for one cannot wait to see what else Jennifer Hartz has in store for Christina and Meric! If you have read my previous reviews of book one and two, you probably know by now just how much I love The Future Savior series! Evacuation was no exception in being just as epic as the first two. I recommend it to anyone who enjoys speculative fiction, but even if you don’t love fantasy this series just might change your mind about the entire genre. Evacuation is an extremely well done continuation of the series and I am SO excited to get started on book four, Desecration. *I should mention that this book has mature content and I don’t recommend it for younger readers. This book and the series that sounds so intriguing! I will have to check it out! Doesn’t it?! It’s definitely one of my new favorite series.